The storm system will strengthen tonight and move up the East Coast. 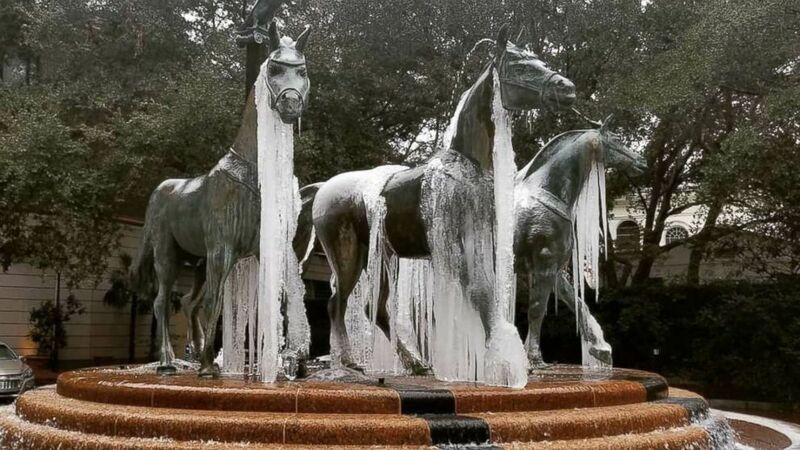 As a snowy winter storm tears through the Southeast today, ice has already formed on fountains in some southern cities, including New Orleans, Savannah, Charleston and Charlotte. 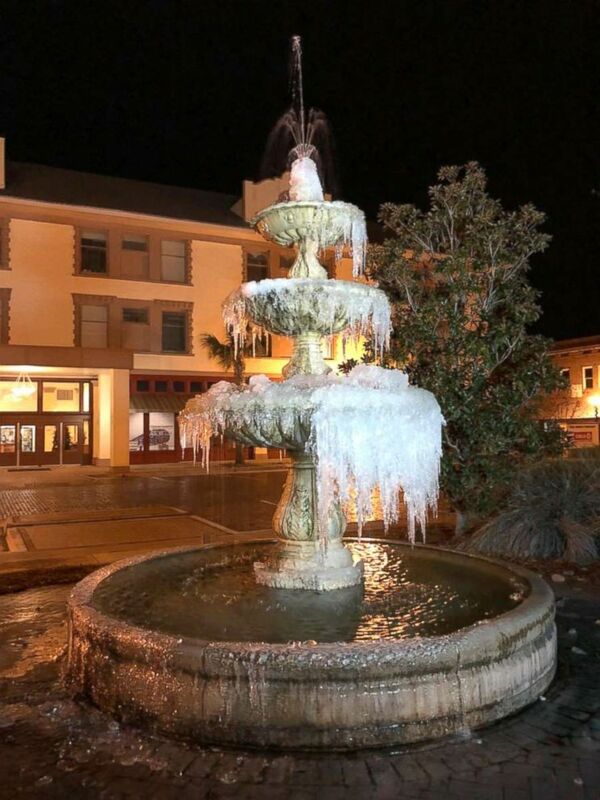 (@WeatherLauren/Twitter) Temperatures hovering just below freezing causes this fountain in downtown Waycross, Ga., to freeze, Jan. 3, 2018. 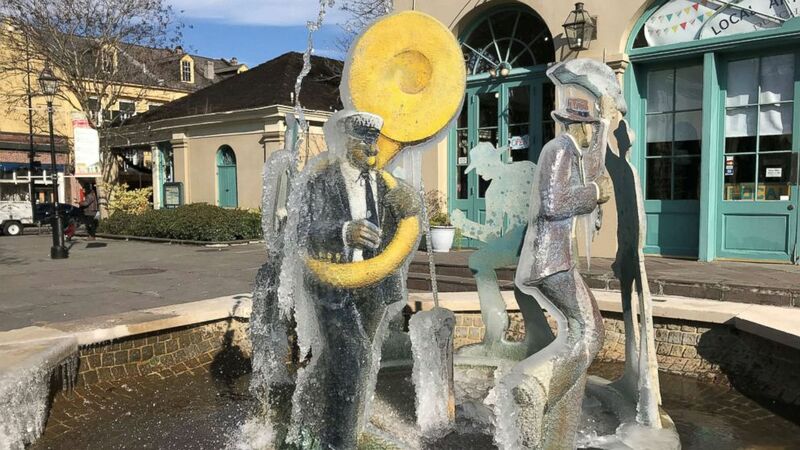 (gildeajake/Instagram) Ice drapes from the fountain at Belmond Charleston Place, Jan. 3, 2018, in Charleston, S.C.
(Maryellen McGrath) A frozen fountain located near Jackson Square in New Orleans, Jan. 2, 2018. Parts of 15 states will see effects from this developing coastal storm. Winter storm watches, warnings and advisories have been issued from Florida to Maine. 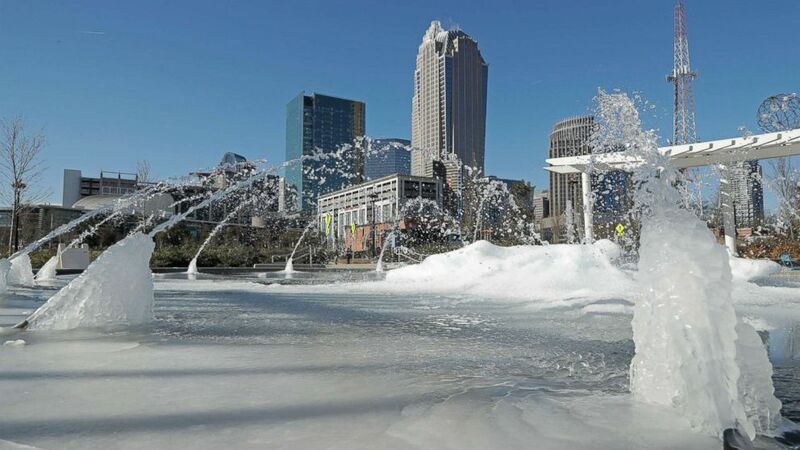 (Chuck Burton/AP) Water squirts from a frozen fountain near downtown in Charlotte, N.C., Jan. 2, 2018. Snow, sleet, ice and rain blew through Tallahassee, Florida, this morning. It was warmer in Juneau, Alaska, than it was in Tallahassee. The Florida State University campus in Tallahassee and public schools in Tallahassee are closed today. Snow and ice have already started to accumulate in Georgia today. Some areas could see up to 4 to 6 inches of snow and up to half of an inch of ice. 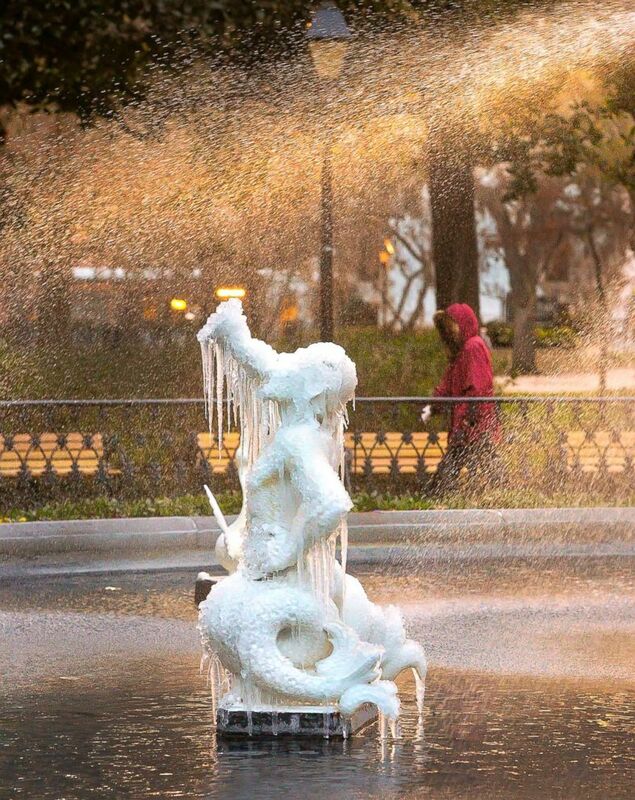 In Savannah, the airport and public schools are closed today as the city braces for the freezing rain and snow. 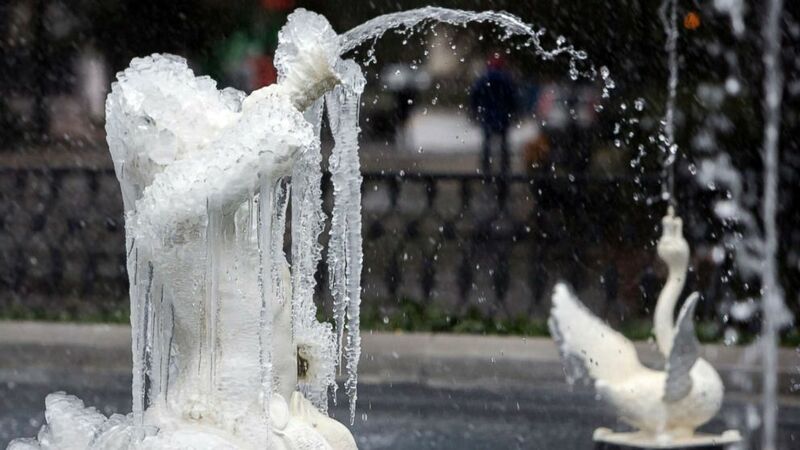 (Steve Bisson/Savannah Morning News via AP) Icicles form on the tritons in the Forsyth Park Fountain on Jan. 2, 2018, in Savannah, Ga.
(Stephen B. Morton/AP) A frozen fountain in Historic Forsyth Park still works despite freezing temperatures and rain, Jan. 3, 2018, in Savannah, Ga. The snow is also falling in South Carolina and the state Highway Patrol is urging people to stay off the roads. The runways at the Charleston International Airport were closed this morning due to icy conditions. Both the College of Charleston and Charleston County School District schools are closed today. 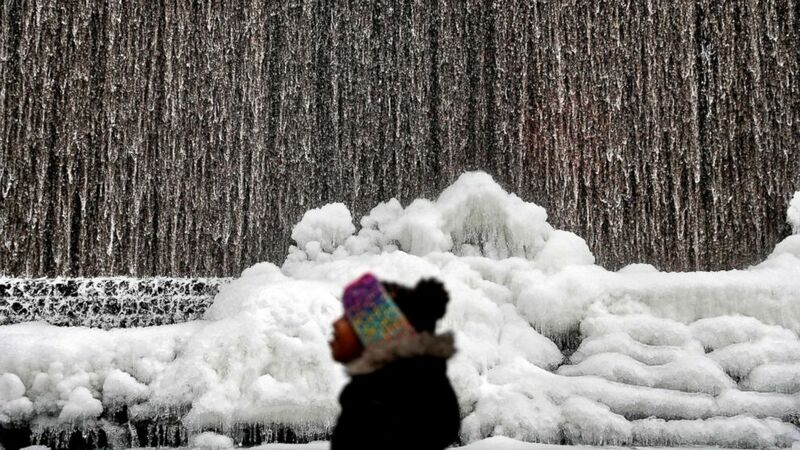 (David Goldman/AP) Alora Freeman, 8, watches as ice builds along a downtown water fountain in Atlanta, Jan. 3, 2018. The storm system will begin to strengthen tonight and move up the East Coast, dumping snow into the eastern mid-Atlantic states and southern New Jersey. By early Thursday morning, snow will cover Long Island and southern New England.